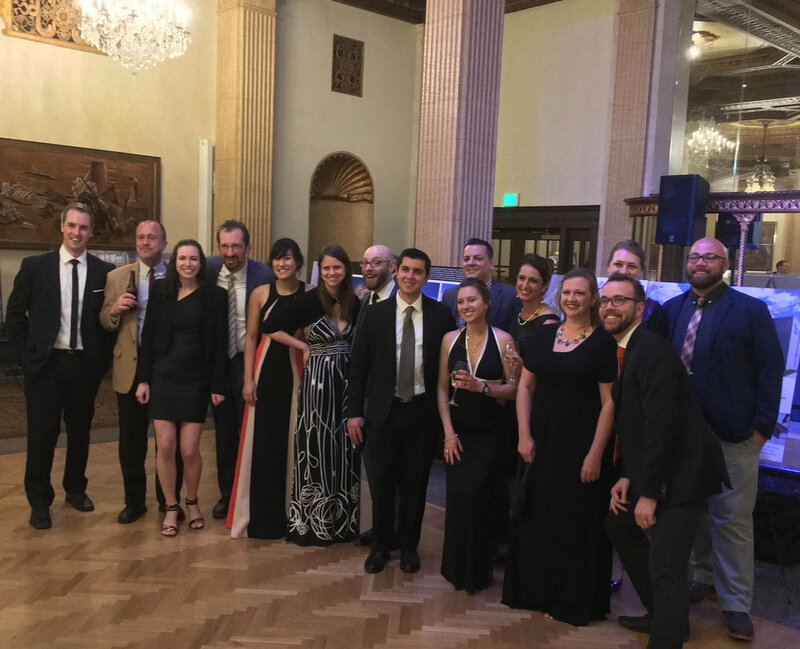 On Friday, October 27, AIA Central New York held their annual Celebration of Architecture at the Hotel Syracuse. Two Ashley McGraw projects were recognized, Syracuse University Falk College’s Department of Public Health, Food Studies, and Nutrition and the Koffman Southern Tier Incubator. AIA CNY, a chapter of the American Institute of Architects, recognizes outstanding works of architecture through its annual design awards program. The purpose of the program is to celebrate achievements in design excellence by Architects in the Central New York region; and to honor the architects, clients and consultants who work together to create and enhance our built environment. Asked to repurpose the former Syracuse University Law College to support the consolidation of the Falk College departments, the key spaces of the food studies and nutrition program have given Falk College its own unique identity on-campus. The ACE Center’s demonstration kitchen features an island-cooking suite at the front of a 50-seat lecture hall. Cameras capture the activity of cooking from every angle, images are projected on 3 large TV screens above the counter, giving the audience multiple perspectives of the activity at hand and providing the possibility of recording or broadcasting. The Susan R. Klenk Learning Café and Kitchens includes an 8 station-teaching kitchen and an associated café. Lunch will be served in the café during the last four weeks of each semester, allowing hands-on experience for the students at every stage of food planning, preparation and service. The Falk Café is a new food service destination to be operated by Syracuse University’s food service department. Designed to integrate with the visual style of the nutrition program, this space is envisioned as a core-mixing place for students and faculty of the various programs to meet, interact, and share ideas. The 35,000 SF Incubator houses a mixture of offices, collaboration spaces, wet and dry labs. Collaboration and co-working spaces are sprinkled throughout the building in order to facilitate innovation and idea sharing amongst a new generation of entrepreneurs. Spaces are designed to be as flexible as possible to accommodate a variety of start-up companies and their future growth. The Koffman Southern Tier Incubator provides a supportive environment for entrepreneurs and startup companies. Every inch of the building has been thoughtfully designed to provide working spaces that inspire individuals and companies to create and develop transformational, innovative products and ideas. Sustainable and passive strategies including geothermal well field, pre-heat wall, and daylighting are incorporated throughout the building.